Decide where you're going to place the pyramid puzzle. You'll need a '9' square (3x3 tiles) area in which to place all the pieces. The centre square (tile) is the centre of the pyramid, so start off by placing a 'TRIGGER TRIGGERER' null mesh object on this square. Then Click the button marked 'T' on the control panel (next to the Button marked 'B' below the green 'climb' buttons), this will show as a 'BLUE' border around the square (tile) in the 2D window top left. Select the nullmesh 'TRIGGER TRIGGERER' object and then click on the 'NORTH' adjacent square (tile) and click the 'PINK' trigger selection button. Repeat on all four adjacent squares (north, south, east and west) selecting the SAME null mesh object each time beforehand. Now place your puzzle prize, this can be a key or any pickup you desire. Place it on the centre square (tile) and raise it by '4' clicks. Now type 'O' on your keyboard to open the 'OCB' window and type in the number '4' and click the button marked 'INVISIBLE' this will ensure the pickup can be picked up by Lara and it will be invisible until the 'TRIGGER TRIGGERER' has been triggered. Now select the puzzle prize and click the centre square (tile) and then click the 'PINK' trigger selection button. 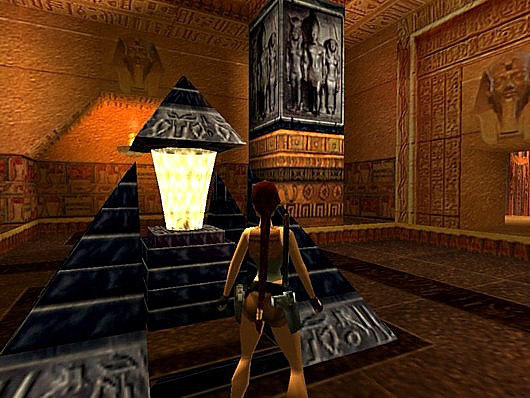 This will, when Lara has completed the puzzle, make the puzzle prize visible. Next place 'ANIMATING 4' (this is the plinth upon which sits the puzzle prize) also on the centre square (tile). Now place 'WATERFALL 1' on the centre square (tile) and open the OCB window and click 'INVISIBLE'. After selecting it again, click the centre square (tile) and then click the 'PINK' trigger selection button. Then place 'ANIMATING 3' on the centre square (tile) and trigger this on the same square (tile). Next place the tip of the pyramid 'ANIMATING 2' on the centre square (tile) and trigger this also on the same square (tile). Now place '4' of 'FURNITURE 0' (pyramid corner piece) on the centre square (tile) using the 'RIGHT' mouse button to position each one till you have one at each corner. Next place '4' of 'PUZZLE HOLE 12'. Each one on the north, south, east and west adjoining squares (tiles). In order for the puzzle to work, you'll need to place '4' of 'PUZZLE ITEM 12' objects anywhere in your level, and enter '2' in the OCB so that they appear at the correct place on the wall. You'll also need to place a 'CROWBAR' object in your level so Lara can lever them from the wall. Now test your pyramid. If Lara is able to collect the puzzle prize BEFORE inserting all four of 'PUZZLE ITEM 12', then you've forgotten to set the object bits in the trigger dialogue box.